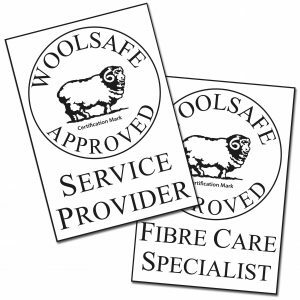 This is the course you must succesfully complete if you wish to apply to become a *WoolSafe Approved Service Provider. This on-line training course assumes that the student has reached a reasonably high level of competence and experience in cleaning carpets and rugs. It is also intended to be an essential reference and resource for those who are concerned with maintaining residential (domestic) or commercial (contract) wool carpets and rugs, whether they become a WoolSafe-Approved Carpet Care Specialist or not. Sound technical training, experience and knowledge ensures not only that the best possible service is provided to customers, but it also provides a means of promoting one’s own skills to potential clients, in contrast to the lack of skill displayed by those without the necessary training, expertise and experience. With this objective in mind, this course initially follows wool fibre from fleece, to yarn, to carpet, and therefore, it describes aspects of textile processing and carpet manufacture. Initial processing and carpet or rug construction is followed by issues concerned with actual cleaning. These aspects of what are essentially textile technology, determine the ways in which wool carpet and rugs should be maintained and cleaned. Each course module is followed by a self-evaluation in the form of questions, some multiple-choice, some requiring a written answer. They are based on the information presented in the current module. Simply read the question and select the correct answer from the options provided. *subject to passing the qualifying criteria and payment of registration and network membership fee.